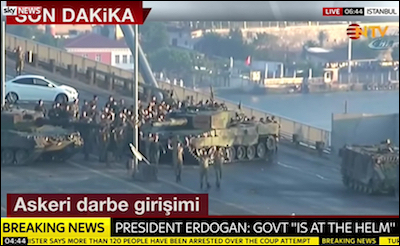 Turkey's NTV TV shows soldiers involved in the coup attempt surrendering on Istanbul's Bosphorus bridge, July 15, 2016. Everything looked surreal in Turkey; soldiers inviting the head of the police anti-terror squad for a "meeting" only to shoot him in the head; top brass, including the chief of the military general staff, air force commander, land forces commander and gendarmerie commander, being taken hostage by their own aide-de-camps; then people taking to the streets in their thousands to resist the coup d'état, taking over tanks, getting killed, soldiers opening fire at the civilians, and finally the victorious pro-Erdogan people lynching coup-staging soldiers wherever they could grab them. President Recep Tayyip Erdogan accused his formerly staunchest political ally, a Muslim cleric in exile in the United States, Fethullah Gulen, and his loyalists within the military. Appearing before a crowd of party fans, Erdogan pleaded to Washington for "the terrorist" Gulen's extradition. Erdogan's intelligence and loyal police force immediately arrested nearly 6,000 military officers and members of the judiciary, claiming that they belong to the "Gulenist terror organization." Justice Minister Bekir Bozdag said that more arrests were in the offing, signaling a witch hunt across the country. Immediately after that move the Interior Ministry suspended 8,777 officials, including governors, suspected of being "Gulenists," and arrested thousands in the judiciary. Many liberals believe the government will use the coup attempt as a pretext to intimidate its opponents, whether or not with any links to Gulen. Erdogan's Turkey will now be an even more difficult place to live for dissidents. "He [Erdogan] comes out of this tremendously strengthened," says Howard Eissenstat, associate professor of Middle East history at St. Lawrence University in Canton, New York. "This has remobilized a base that was getting sort of tired of him. It gave him at least a moment in which he unified all elements of society against a clear threat." Turkey now will be an even more difficult place to live in for dissidents. Erdogan is already talking about the reintroduction of death penalty. "Our government will discuss [the death penalty] with the opposition," he said when he spoke to a crowd of party fans who interrupted his speech with the slogan "we want the death penalty." Then he said he would endorse the reintroduction of the death penalty if parliament approved it. The 1933 Reichstag fire provided a critical pretext for the Nazi seizure of absolute power in Germany. Meanwhile, the Security General Department (which runs the police force) issued a statement calling on citizens to inform them about any social media material that supports terrorists or the Gulen organization, or that contains anti-government propaganda material. All this Turkish upheaval reminds one of the Reichstag fire, an arson attack on the German parliament building in Berlin on Feb. 27, 1933. A young unemployed Dutch communist, Marinus van der Lubbe, was arrested for the crime. He had only recently arrived in Germany; he pled guilty and was sentenced to death. 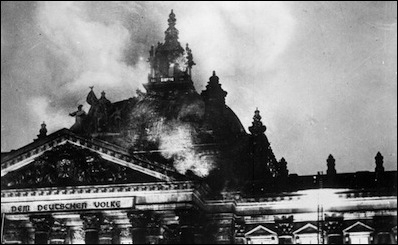 The Reichstag fire was used as a pretext by the Nazi Party to tell its public that communists were plotting against the German government -- a pivotal event in the establishment of Nazi Germany. We may never know if the failed coup of July 15 was a Turkish version of the Reichstag fire. But we do know that it will be used as a pretext to claim that a multitude of enemies, inside and outside Turkey, are plotting against the government.